Find brand names for rock bottom prices on 6pm.com. 6pm offers shoes, clothing, bags, and accessories at amazingly discounted prices. These are brands that you love, including Etnies, DKNY, Hugo Boss, Steve Madden, amongst many others. Go all out on couture -- at 6pm you can get up to 75% off of high quality fashion. 6pm allows the whole family to get in on a wide array of bargains, relieving the wallet and putting smiles on faces at the same time. Before you shop, check RetailSteal.com for 6pm coupon codes, 6pm discounts, and 6pm promotions. 6pm offers a flat rate shipping price of $6.95 regardless of the order size, and only ships to territories in the US. Shipping usually may take 5-10 business days but for additional fees you can select 1-day or 2-day shipping. Check website for full details, exclusions may apply. Shop online at 6pm.com and take advantage of up to 75% off top designer brands. Click link to start shopping. Sign up for the rewards program at 6pm.com and you'll earn a 10% discount. Click link to shop. Act now and take advantage of free shipping on all orders from 6pm.com. No minimum spend required. 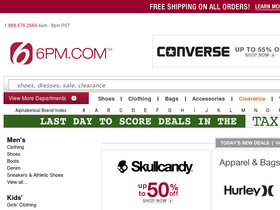 Get up to 75% off women's, men's and children's shoes from 6pm.com. Don't miss out on 6pm's sale on clearance clothing and accesories. Receive 80% savings on all styles. Check out the Hurley sale at 6pm.com and enjoy up to 80% savings. Click link to shop. Shop at 6PM to enjoy 70% savings on Reebok items. Click link to start saving. Designer handbags are up to 75% off retail online at 6pm.com. Click link to shop for BCBG shoes and apparel and you'll save up to 65% at 6pm.com. Shop Target's back to school shop and enjoy up to 75% off top brands. Subscribe for your favorite items and save an extra 5% off Target's already low prices.